This book surveys and analyzes the principal legal doctrines affecting copyright practice around the world, in both transactional and litigation settings. It provides a step-by-step methodology for advising clients involved in exploiting creative works in or from foreign countries. 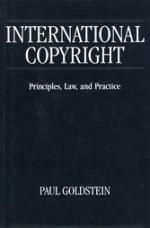 Written by one of the most distinguished scholars of copyright both in the United States and abroad, this volume is a unique synthesis of copyright law and practice, taking into account the Berne Convention, the TRIPs Agreement, and the advent of the Internet. National copyright rules on protectible subject matter, ownership, term, and rights are covered in detail and compared from country to country, as are topics on moral rights and neighboring rights. Separate sections cover such important topics as territoriality, national treatment and choice of law, as well as the treaty and trade arrangements that underlie substantive copyright norms.